with: Radoš Antonijevic, Erik Alalooga, Marc Haselbach, Aleksandar Jestrović Jamesdin, M.I. Kamenoff, Silvia Lorenz, Marina Marković, Tanel Saar, Boris Sribar, Darko Stojkov, Selman Trtovac, Ana Zejak, Veljko Zejak und Gästen. 13. – 22.2. Exhibition, open Mo-Sat 2-7 p.m.
“EASTERN PROMISES” is an international art project of the ongoing exhibition series “Hybrid Object”, which was started by the Serbian-Slovenian sculptor Veljko Zejak in cooperation with various cultural institutions, curators and participants. 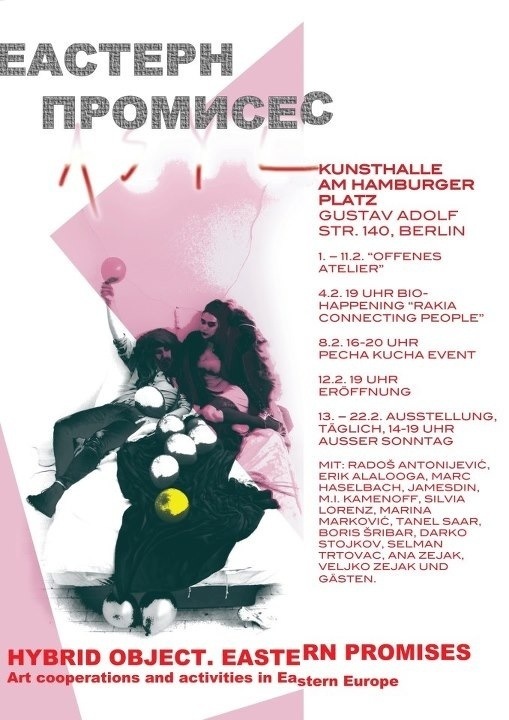 The self-organized series of artistic events took place in Belgrade, Serbia 2010, Spodnij Hotic, Slovenia 2011, Paris 2011 and now in Berlin to generate a creative artist network of different generations and backgrounds. The project combines an “Open Studio” week, a “Bio Happening”, a workshop for students, a Pecha Kucha Event, where the participants present their project spaces and positions (Treci Beograd, Belgrade – MOBA Banatska Dubica, Serbia – Container Art Gallery Tallinn, Estonia) and the final exhibition. The artworks are produced on site and approach the topic from different angels: cooperative strategies, improvisation, irony. A Slavic proverb says: “Obecanje ludom radovanje” – Promises make a fool happy.